In the years since the attacks of September 11, 2001, journalists, commentators, and others have published accounts of the Bush Administration's war on terrorism. But no senior Pentagon official has offered an inside view of those years, or has challenged the prevailing narrative of that war-until now. Douglas J. Feith, the head of the Pentagon's Policy organization, was a key member of Donald Rumsfeld's inner circle as the Administration weighed how to protect the nation from another 9/11. 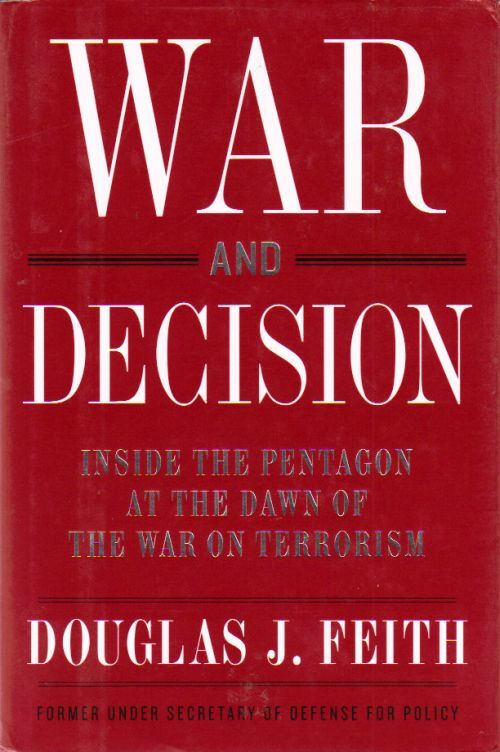 In War and Decision, he puts readers in the room with President Bush, Vice President Cheney, Rumsfeld, Paul Wolfowitz, Condoleezza Rice, Colin Powell, General Tommy Franks, and other key players as the Administration devised its strategy and war plans. Drawing on thousands of previously undisclosed documents, notes, and other written sources, Feith details how the Administration launched a global effort to attack and disrupt terrorist networks; how it decided to overthrow the Saddam Hussein regime; how it came to impose an occupation on Iraq even though it had avoided one in Afghanistan; how some officials postponed or impeded important early steps that could have averted major problems in Iraq's post-Saddam period; and how the Administration's errors in war-related communications undermined the nation's credibility and put U.S. war efforts at risk. Even close followers of reporting on the Iraq war will be surprised at the new information Feith provides-presented here with balance and rigorous attention to detail. Among other revelations, War and Decision demonstrates that the most far-reaching warning of danger in Iraq was produced not by State or by the CIA, but by the Pentagon. It reveals the actual story behind the allegations that the Pentagon wanted to "anoint" Ahmad Chalabi as ruler of Iraq, and what really happened when the Pentagon challenged the CIA's work on the Iraq-al Qaida relationship. It offers the first accurate account of Iraq postwar planning-a topic widely misreported to date. And it presents surprising new portraits of Rumsfeld, Rice, Powell, Richard Armitage, L. Paul Bremer, and others-revealing how differences among them shaped U.S. policy. With its blend of vivid narrative, frank analysis, and elegant writing, War and Decision is like no other book on the Iraq war. It will interest those who have been troubled by conflicting accounts of the planning of the war, frustrated by the lack of firsthand insight into the decision-making process, or skeptical of conventional wisdom about Operation Iraqi Freedom and the global war on terrorism-efforts the author continues to support. 2008 Hardcover. Remainder slash on page bottoms. light shelfwear to cover. Never read.